Should you put laugh metrics in your annual report? If you want a successful business, you have to know your numbers. So, tell me: How often do your people laugh in a day? The more laughter, love and good feelings that we experience and share, the more we expand our ability to bounce back. Work is such a large and important part of our lives that we can’t expect our home lives to do all of the heavy lifting. In my last article here, I wrote about fun at work and why we think that people who have fun in toxic workplaces might just be seen as ‘mucking around’. But as Dr Margaret Mears wrote in the Journal of Pharmaceutical Technology, ‘just because we work … does not mean we have to be serious and somber [sic]’. Few things are as good for the bottom line of both morale and productivity as lighthearted play at work, according to Dr Philip Perry in FOCUS: Journal for respiratory care and sleep medicine. 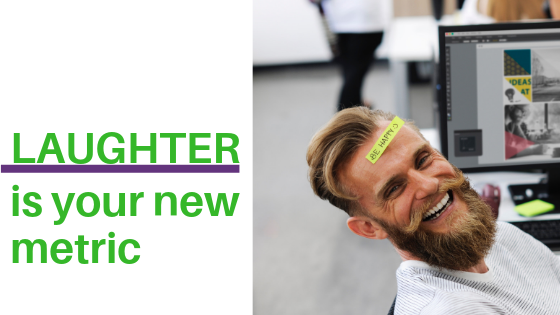 He goes on to explain many of the benefits of laughter, which we at Training x Design have explored previously: Defusing tense situations, relieving stress, helping others feel less threatened about sharing ideas. But he points out one critical element: Laughter (and humour) helps employees to retain information. It’s something that’s well-known in the education sector, and has been systematically studied for more than 40 years. improve enjoyment rates in learning environments. And, in a separate article in Science Daily, researchers pointed out that when it’s used in an online setting, humour-enhanced courses drives higher engagement. It turns out that even when you just make an attempt at humour, the number of comments in an online learning platform increases. Your takeaway from this is that, to be maximally effective, your workplace learning ought to be at least a little bit fun! You will improve your employees’ performance, and their ability to use what they learn, when you enhance your training with humour. One of the reasons is because humour returns wonder to the process of learning. Wonder you might recall, is the starting point for all learning. We become engaged in finding out the answer to something, in changing a situation, in wondering what life might be like if we thought, felt, and acted differently. When we are in a position where we want to learn, want to change, or want to do something differently, we learn much faster. The results of these studies give us some leading indicators that may suggest how we can shape our customer service delivery. One article in Science Daily tells us that humour can make your business feel more personal to customers. You don’t need a team that is up-standingly funny. Genuine attempts at wit, in the right place, will help your service and sales teams bond more easily with your customers. Dr Margaret Mears suggests that it goes much further than this. She argues that a happy team will result in fewer complaints. She goes on to point out that this is just the beginning: That a happier team will be more creative, will solve challenges more quickly. And that your business will increase. ‘Who wants to refer others to an old grouch?’ she writes. Why and how could we measure laughter? Fun researcher Bernard Louise De Koven suggested that ‘you can predict a successful business if you can hear heartfelt laughter 10 to 12 times per day’. He suggested that this is because people take laughter home with them to their families. Something to think about Start keeping a track of how many times you hear your coworkers laugh in a day. What metric might work for your workplace? Stanford University’s The business case for happiness suggests that a laughter metric is a good one. Their recommendation was similar: To measure the number of laughs or smiles per day. But they also add that you could get people to track their own smiles and laughs, and then report them in a daily survey. However, the Business case also pointed out one of the most significant criticisms of self-reported laughter metrics. It’s not exactly objective, they point out. But you might find that people simply don’t do it. Something to think about Consider the end-point of the laughter metric. What is your goal? It’s to take a pulse of the happiness in your workplace. What other methods might you use? If a metric is too much, just start with laughter. Peter Bregman, who is a public advocate of the laughter metric, suggests that one of the best places to start is just with how much you laugh. If you think that this would be too hard – because you don’t know how many times you laugh in a day right now – here’s something to think about. How many times a day do you really laugh? Chuckling doesn’t count! It’s the big, full, belly-laugh. You already have an idea, don’t you? And I’m betting that the answer is ‘less than one’. If that’s the case, then Bregman’s suggestion will help you. He suggests just picking a number – like, 3 – and then trying to achieve it. Something to think about Instead of measuring laughter in your entire workplace, talk with your team and see if you can set some team goals. How many times a day do they laugh individually? Or as a team? One of the oddities about laughter is that if you are consciously present and engaged, laughter will just emerge. Mikel Chertudi explored this at length, and it’s something that we cover in The ORANGES Toolkit, too. It’s that you can create the conditions for engagement and enjoyment. To increase your laughter, all you have to do is give yourself permission to feel it. Something to think about Recognition and permission are as much a part of laughing at work as anything else. Nobody is going to increase how much they laugh if they are told off! How can you encourage your team to give itself the privilege of laughter? How can you encourage your team to give itself the privilege of laughter? Might a team goal be more effective than a workplace goal? How many methods can you think of that could help you track laughter and happiness? What regular activities (team meetings, 1:1 coaching, training) present an opportunity for adding a laugh dimension? Laughter can lighten your workplace, improve your customer service, and really change how your employees learn. You can increase how much laughter is heard in your workplace by teaching employees how to be present. Additionally, permission is a big part of workplace laughter: If people are allowed to laugh more – and encouraged to! – they will. The E in ORANGES stands for Energy, which is what you get when you have fun! Laughter is a big part of it, because it’s the fastest way to increase your energy. The E workshop in ORANGES is the sixth of seven workshops delivered over a two-day program. The program empowers your team members to learn and use 40 mindset-improvement strategies, which have an incredible impact on workplace cultures. The program is so impactful that participants can put the strategies in place immediately. Gina Brooks is the Director of Training x Design and has been helping people to Think more, Do more & Feel more for over 20 years. She speaks and writes about leadership, emotional intelligence, culture and how to stimulate creativity and innovation at work through learning. I would certainly give Training x Design a 10 out of 10. Simply because a lot of time and care was take into target our specific needs for the STAR program. We got the relevance we need to assist in the success of the overall program. Working with Training x Design was money very well spent. Training x Design developed a sales and customer service training for our visitor centre. The training was expertly tailored to our needs. Feedback from the team indicates that everyone enjoyed the day and felt that it was definitely worthwhile. Increased number of paid interventions from 22 – 150 per quarter – direct result attributed tothe training provided by Training x Design. I was blown away by the professionalism and ability to make things happen throughout this entire consultation process. The learners not only gained valuable customer service skills but have come away with a different approach and attitude and their confidence has grown and our customer feedback is better than ever. This program gave us exactly what we were after: A consistent sales approach across all centres. The feedback from staff was great. I’m still hearing about it. The only improvement from our end is that we should’ve done it right a long time ago. It was a great opportunity for us to get all our team together in the one place – doesn’t happen very often! The training was relevant to what we do in the visitor centre. Gina's passion for training shines through. Gina has a wide knowledge base and always implements a well thought out program for training. She is really good with the staff, keeps them interested. Her workshops are fun but she allow enough structure for personal/team reflection. She keeps her knowledge base up to date and her methods are always current and innovative. Highly recommended. The presenter is one of the best I have been involved with in 20 years, her ability to remember the students names was endearing and her sense of humour was great. The training was more geared to the practicality of our unique circumstances which a lot do not. Congratulations!! An excellent, valuable course, made into a fun topic of discussion by the trainer. I found this course to be extremely relevant to both work and daily life. The quality of the course was outstanding. A lot of valuable and useful information, well prepared, good reference material, good balance between theory and examples, very useful to improving workplace communications. Training x Design is a South Australian training innovator and our aim is to empower people to maximise their potential. We deliver customised training programs that help you develop a unique workforce that thinks, behaves and feels differently. If you’re having fun at work, does it mean you’re not working?